I recently gave a presentation on “alternative” filaments you can use with your 3d printer. My focus was on filaments you can print without a heated build platform (HBP) – mainly due to my own printer (a Makerbot Replicator 2) not having one. A common misconceptions is that without an HBP – you’re limited to printing in PLA. In reality you can get great results with materials like Laywoo-D3, Taulman t-glase / Nylon 618, Soft PLA and others. The presentation has a lot of in-depth info on print settings for each filament and their strengths / weaknesses – more info that I can easily included here. I also cover some general printing tips and ways to make your print into other materials by casting. Soft PLA is PLA modified with something that makes it soft, super-tough and rubber-like. Yes – the duck floats! If you’re interested in printing with soft PLA – check out the presentation for some very important notes on getting reliable print results at reasonable speeds. Laywoo-D3 is plastic filament with wood particles added. LayBrick includes some kind of mineral substance. They aren’t super-strong – but they both produce stunning results which don’t look like traditional 3d-prints. These owls were printed at 150 micron layer height. Taulman Nylon 618 is a very tough filament – the toughest I’ve worked with. I used the clip above to secure a bag to my bike rack – it can support a surprising amount of weight. You can also color it using fabric dye! Printing in Nylon 618 requires some tricks for good results – see the presentation for some important notes (I haven’t figured out how to get reliable results with the transparent Nylon 645 variant yet). PET is a very clear, rigid filament – however is fairly brittle. It prints easily with good adhesion and minimal curling. Taulman offers a PET variant (PETT) under the name of “t-glase.” It’s not clear exactly what it is – but it seems significantly tougher than the other PET filament I’ve printed with. It prints easily – and is probably your best option for transparent prints without a HBP. If you have adhesion issues – try moving your nozzle closer to the build plate. Obri-tech PLA 45 (no U.S.-based source yet) is another kind of modified PLA. It’s much tougher than regular PLA while still being reasonably hard. It’s also highly resistant to curling which makes it great for solid prints (like this bike part). It is not quite as tough as Nylon 618 – but is much easier to print. Note how the octupus legs are bent – but not broken. 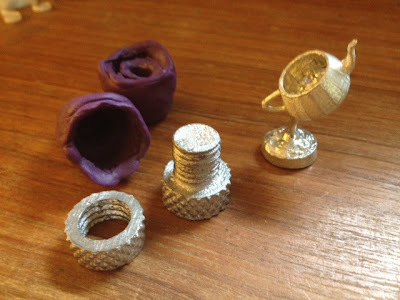 No – you can’t print in metal at home (yet) – but you can easily cast. I used silicone molding putty and ROTO281F (a lead-free low melting temperature metal) to produce the nut / bolt from a Laywoo-D3 print (PLA should be fine too). My father used trickier lost-wax (lost-PLA) style casting to make the sterling silver tea pot. I printed a mold for these octopi in soft PLA and then cast them in urethane resin. Have fun! New nozzles are only about $5 on ebay….
. its a useful product for the people who has a high load of printing work in offices and home. It's much harder than customary PLA while even now being sensibly hard. It's likewise quite impervious to twisting which makes it extraordinary for robust prints. One of my favourite filaments is Taulman, PETT variant, Taulman t-glase PETT Clear 1.75mm to be exact. We usually use this to some transparent containers and cases like the one above (iPhone case). Unlike some lines, there are no odour or fume when 3D Printing with t-glase. Dont forget HIPS and PVA both of these plastics are very high quality, and yeild awesome results. PVA is dissolvable perfect for making bearings, or other items that require and intricate support during printing.